Maybe we've done this for too many years now, but this CES 2008 was - how can we put this kindly? - quiet. There's been an awful lot of the usual: flatter TVs, bigger TVs, higher-speed wireless, higher-capacity wireless, more function-laden mobile phones, more storage on smaller devices and tentative steps toward better connectivity between disparate CE products. If it wasn't for the political disquiet in the high-def video stakes, Panasonic's jumbo 150-inch plasma, and Bill G's CES swansong, there would have been very little of note to report. The Force wasn't with CES in 2008. Attendance seemed to be down on '07, the stands became quieter sooner during the week, and far too many press releases where regurgitated from months - even years - ago. But CES is still a useful snapshot of where we stand in the evolution of consumer electronics. And, for everyone except Apple, CES still sets the tone for the rest of the year. If you've been following our news feeds for the last few days, you've probably already guessed who's come out of this year's CES with a smug, Cheshire Cat grin on their face. And who hasn't. 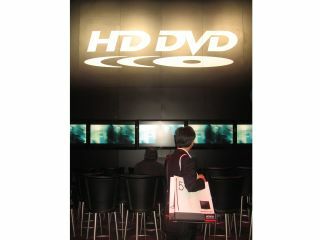 Yes, Sony and the Blu-ray camp have all but claimed victory in the great high-def format war against Toshiba's HD DVD. The lads in the Blu corner have pretty much been handed victory after Warner Bros dramatically decided to drop HD DVD like a stone last week. It gives Blu-ray a 5:2 score between the 'big seven' Hollywood studios, with Paramount and Universal expected to make a similar jump to Blu-ray as soon as their exclusivity contracts with HD DVD expire. It's calamitous news for Toshiba, Microsoft, Intel and the rest of the HD DVD alliance. According to a Warner Bros spokesperson quoted on BBC News, Blu-ray has been outselling HD DVD by three to one. If the two remaining Hollywood studios behind HD DVD - Universal and Paramount - have similar sales stats, then the writing is on the wall for Toshiba and its followers. Even Microsoft's flirting with the other side. With the two warring parties locked in battle for so long, that a possible tipping point has been reached now is ultimately good news for consumers in the long-term. Unless, that is, you bought an HD DVD player last week. But spare a thought for the event organisers behind the HD DVD Promotion Group stand. Within hours of Warner's announcement they had cancelled their CES press conference and dodged media interviews. The HD DVD zone was eerily quiet all week. It's a shame. You could argue that HD DVD is a superior HD format, that it's also a finished format (Blu-ray's Profile 1.1 doesn't even make internet connectivity mandatory)... But what would be the point? Similarly, when Toshiba's smart new G45-series laptop turned up in our office, it should have been a newsworthy event. The Qosmio G45-AV690 is the world's first laptop with a HD DVD-R/RW drive. But after this week's news, any excitement at our end has had a bucket of cold water thrown over it. Sure, you'll be able to archive lots of data to HD DVD, but that's hardly the stuff of high-impact news stories. So. Blu-ray. You'll be hearing that word a lot more in 2008 and beyond. HD DVD? Not so much. Except perhaps in the same breath as Betamax.